from Horseshoe Cave. (Photo by Jack Fisher). 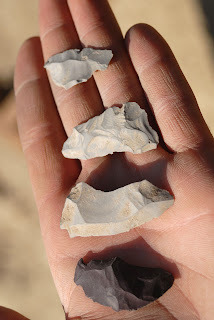 Eryka Thorley had already excavated ancient fire hearths and stone flakes, but a severe thunderstorm on the final day of field work added a new dimension to the archaeology dig in southeast Montana. As rain careened through gullies and lightning sliced the sky, the recent Montana State University graduate from Michigan and three MSU undergraduates took refuge in the rock shelter they had been excavating the past two weeks. Thorley imagined prehistoric Native Americans experiencing the same kind of weather thousands of years ago. MSU archaeologist Jack Fisher worried that they'd be unable to drive out the next day. "I was sweating," he said. "It was a tremendous storm right on top of us." The MSU team, which made it out after all, started excavating Horseshoe Cave in July after federal archaeologists and local ranchers asked Fisher to continue a project that University of Montana archaeologists had conducted in 1976, Fisher said. On the last day of the 1976 dig, the UM team had found a spear point believed to be more than 7,500 years old. The August and Mary Sobotka Trust Fund, administered by the Montana State Historic Preservation Office, allowed MSU to pick up the project, Fisher said. Others on the MSU team were Seth Alt of Bozeman, Clint Garrett of Texas, and Dallas Timms of New Mexico. Halcyon La Point and Michael Bergstrom, archaeologists with the U.S. Forest Service in Billings, provided supplemental funds and logistical support. The group reached Horseshoe Cave by driving about 25 miles south of Ashland, then following a "non-existent dirt road" through brush flats and gullies in the Custer National Forest a few miles from the Tongue River. After setting up tents, they systematically started excavating the cave that got its name from a horseshoe embedded in the wall. "It was priceless," Thorley said. "As an undergraduate, it's just a great experience to work one-on-one with Dr. Fisher." Garrett said the undergraduates got to do everything graduate students would've done if MSU's Department of Sociology and Anthropology had a graduate program. They strung a string excavation grid around the two areas they would excavate. They used trowels and bamboo probes to dig down about 10 centimeters at a time until they were almost three feet below the cave floor. They shook the dirt through screens to see what it held. They recorded anything they found and placed it in plastic bags for later study. were porcellanite. (Photo by Clint Garrett). Fisher, La Point and Bergstrom presented their findings in early October at the Plains Anthropological Conference in Laramie, Wyo. Fisher, back in his lab, said the team found three fire hearths, nearly 100 stone artifacts and hundreds of animal bones. He pulled out one bag that held red and grey flakes made out of porcellanite, a stone native to southeast Montana and widely used by ancient people. The flakes were apparently left over after making tools, Fisher said. Another bag held a perforating tool that looked like it could've been used for sewing. One bag held a bison bone. Others held tiny rodent bones. "The big question is what sort of group of ancient people were using Horseshoe Cave," Fisher said. He wants future research to gather more information about the environment when the cave was used, Fisher continued. He wants to answer a variety of questions, such as the number of times the cave was occupied, how it was used, how the rock shelter was formed and more. "We know from elsewhere that the climate did change somewhat over the past 9,000 years, so we will sample the soil to look for pollen from different time periods," Fisher said. 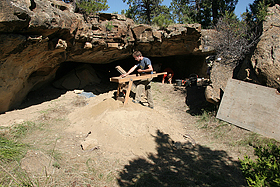 Bergstrom, an archaeologist with the U.S. Forest Service, said caves are well-known for sealing evidence of multiple occupations, and he was excited about the possibilities of Horseshoe Cave. "It's a very significant site in terms of the paleo-potential there," he said. "We don't have that many sites in that area of Montana that have produced or potentially could produce real old evidence of human occupation." Thorley, who is taking time off to apply for graduate school, said her experience in Horseshoe Cave was invaluable even though she is more interested in socio-cultural anthropology than archaeology. "It was very neat, because you know people were in there doing things," she said. "It was very cool to hang out in this cave."